John Hardgrove has been a member of Wests Ashfield since 1965 and has lived in the Inner West most of his life. He has seen many changes in both the Club and its community over those years. John has been a Debenture Holder of the Club for the last 25 years. He held the position of Chairman of that group for several years. 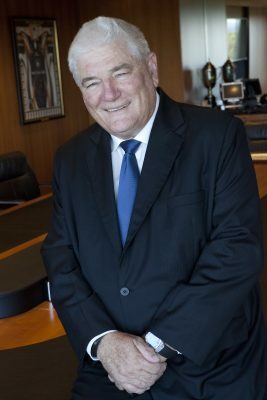 He was elected to the Board in 2011 and has made a positive contribution since that time. John is a retired educator, administrator and consultant. He holds a degree in Economics and a Master’s degree in Administration. His sporting interests include rugby league and other forms of football, cricket, golf, athletics and almost all other sports. His other interests include family, reading, politics, the economy and travel. John is a keen Wests Magpies and Wests Tigers supporter. He is the immediate past President of Western Suburbs District Cricket Club and was a Board member of that club for 10 years. John’s interests on the Board are the continued growth, effective administration and success of Wests Ashfield in order that it can continue to provide high quality facilities and services for members and support to local sporting and community groups. He has been very active in the Club’s drive to further engage with our community through his Chairmanship of the Club’s Community Engagement Committee and also as Chair of the LGA ClubGRANTS Committee. As a member of the Building Committee, John was actively involved in the Club’s car park development as well as planning for and building our new food and beverage areas. John looks forward to the continual improvement in facilities and entertainment for our members and their guests.